Yield for pedestrians: It’s not just the law; it’s a life. Surprising Aspects of Florida Pedestrian Laws. Best Foot Forward for Pedestrian Safety is a coalition of civic leaders, public safety officials, engineers, educators, transportation planners, advocates and concerned citizens, like you, coming together in Metro Orlando to cut pedestrian deaths and injuries in half through Engineering, Education, and Enforcement. If you are already on our mailing list, no need to resubscribe; this is for folks who may have had this newsletter forwarded to them by a friend or colleague. 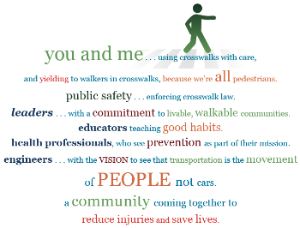 Welcome to your Best Foot Forward for Pedestrian Safety community newsletter. You are receiving this email because you have either specifically requested it, or you are part of our coalition — by virtue of your position in the Central Florida community or direct contributions of time, talent or treasure. Suffice to say, we’re glad you’re here, and THANK YOU! for your support. This from Florida Today. The Cocoa Beach City Commission may pass a bicycle-pedestrian harrassment ordinance on October 4th. Mayor Skip Beeler, a bicycling enthusiast, has had enough of discourteous and impatient drivers who have yelled and honked their horns in his ear. The ordinance is designed to protect bicyclists, pedestrians and joggers from abuse and harrassment. Cocoa Beach police would have to personally witness the infractions in order to issue citations. First time offenders would receive a fine of $100.00. Repeat offenders would have to pay $200.00. If you have travelled on Virginia Avenue between Mills and Orange, you will have seen the extension of the Orlando Urban Trail and crosswalk. If you have not seen this new crosswalk, you might be taken aback by the new and different lighting system, an RRFB, or Rectangular Rapid Flashing Beacon. 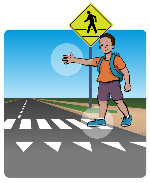 RRFBs have been proven to reduce pedestrian crashes by increasing driver awareness of potential pedestrian conflicts. RRFBs may also be known as an LED rapid flash system, stutter system or LED beacon. An official FHWA study conducted in St. Petersburg, FL found that RRFBs are dramatically more effective at increasing driver yielding rates to pedestrians than a traditional overhead beacon. A slightly different version of the RRFB can be found on Highland Avenue, at Lake Highland Preparatory School. They certainly get your attention, and that’s always a good thing! OOSSSS S Audubon Park Elementary School kicked off the Orange County Walk N’ Roll campaign on Sept. 12, encouraging parents to forego their cars and walk or bike to school with their children at least once a month. Several other Orange County schools plan to participate in the initiative beginning the second Wednesday in October. We would like to get volunteers (2 per school) to hold iYield4PEDs signs and hand out flyers. If you can volunteer one hour of time (8 am to 9 am) on Wednesday, October 10, please contact Marianne at 407-412-5980, or by email: [email protected]. A 1995 National Personal Transportation Survey found that about 40% of all trips were less than 2 miles, or a 30 minute walk. Walking and bicycling can help to reduce roadway congestion. Many streets and highways carry more traffic than they were designed to handle, resulting in gridlock, wasted time and energy, pollution, and driver frustration. Walking requires significantly less space per traveler than driving. Roadway improvements to accommodate pedestrians can also enhance safety for motorists. The iYield4PEDs campaign of engineereing, education and enforcemet is already making our neighborhoods safer for pedestrians. Next time you need those few last-minute groceries, consider walking or bicycling. No congestion on the road, no parking hassles and you can feel healthy and smug, too. A new column listing upcoming organized walks for people of all ages and abilities. If you know of other organized walks coming up, please let us know! Sun. Sept, 23, 8:00 am: 2nd Annual Let’s Move Day, Apopka 5K Walk/Run and Health Fair, Seventh-Day Adventist Church, 340 E. Votaw Road. Details Here. Fri. Oct. 5, 9:30 am: Monthly Downtown Orlando Historic District Walking Tour, led by Richard Forbes, Historic Preservation Officer for the City of Orlando. For more details check here . Sat. Oct. 6, 8 am: Winter Park Mayor’s Sole Challenge at the Stage in Central Park at 236 N. Park Avenue, Winter Park, FL 32789. For details please call 407-644-2300 ext.241. Sat. Oct. 20, 2012, 9 am to noon: 12th Annual Wiggle Waggle Walk to benefit SPCA of Central Florida.Billed as the biggest and best pet walk in Seminole County, the fundraising event will be held at Cranes Roost Park at Uptown Altamonte. For details about fundraising or the day’s events check the Seminole County SPCA website. Sat. Oct. 20, 2012, 9 am: Making Strides Against Breast Cancer 5K Walk of Metro Orlando at Lake Eola Park. Sign up here. About the picture in our header: This trompe-l’oeil, or forced perspective, painting of the Peanuts gang adorns a crosswalk outside of Universal Studios: Japan.THANK YOU SPONSORS!! !